Two middle-aged and poorly disposed travellers make their way to Florence for a day to relive a youthful episode that took place thirty years previously. The result was a series of back aches, some memory loss, far too many half baked impressions and a few insights into where Le Corbusier stole his ideas from and the reason why Winkelmann may have led us all astray, from Benvenuto Cellini that is. Big Brain 30 years! Life is just flowing through my hands like water. Shakey Piazza della Signoria, here we are, just for a change. Big Brain Bloody David again! Shakey What’s the matter now, Michelangelo not good enough for you? Big Brain Just look, he’s got the neck of a swan, dinosaur feet and hands the size of houses. Perfect proportions my arse! Shakey Rubbish sculptor, great architect? Big Brain Exactly! Couldn’t sculpt the female form if you paid him, just a bunch of blokes with spongey breasts tacked on. Couldn’t have been less interested in women clearly. Shakey And what’s all this David and Goliath business, everywhere you turn there’s a bloody David with no clothes on. Just an excuse for some young boys with their kit off and some dodgy David and Goliath myth slapped on for decency’s sake. Big Brain Perfect bottoms, that’s what it is all about. Now Cellini….take a look at that Perseus. No way this is an excuse for a pert bottom. Shakey It’s damaged isn’t it, no toes or something? Big Brain I need a drink. If it hadn’t been for Winkelmann we would be looking at something decent, he was gay they say. Big Brain Killed by a rent boy. Big Brain He’s the one who got us all looking at these bloody Davids with perfect arses. Now Verrocchio, he is the real thing. Shakey What’s all this ghoulish decoration on the Cellini plinth? Big Brain Haven’t got a clue. Big Brain Yes, and then I’ll tell you about Le Corbusier. Big Brain His Mum couldn’t see the point of it all, much preferred his brother you know. Did his best to do the right thing by her. Bit of Nazi too, or perhaps just apolitical. Vichy and all that. Opportunist. Big Brain He was just a monk manquè, tomorrow I’ll show you the cells at the Charterhouse of Galluzzo, nicked all his ideas from there. Wanted us all living in perfectly proportioned cells. Nicked a great idea for a folding table too. Big Brain Morose place this. Big Brain A bit oppressive really, just a lot of fortresses masquerading as palazzos. Ruskin hated it here. Big Brain No. But it is drab, and very bourgeois, provincial. Shakey It is now but…. Big Brain Henry James said Florence was “spontaneous, joyous and irresponsible”. Shakey He would, that’s all he was ever looking for, bound to find it everywhere. Big Brain Now the Pazzi Chapel, that is the real highlight. Shakey It’s dreadful, looks like some hieroglyphic pagoda. Big Brain Is this free association tourism then? Shakey It’s just a mnemonic so that architects wouldn’t forget the neo classical canon, a hieroglyph, but as a building completely unusable. Big Brain Drink your beer and don’t talk rubbish. Shakey So what was the high point then? Big Brain Easy. 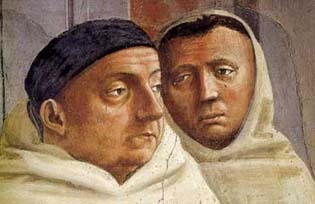 Masaccio. How did they go from a boring old two dimensional Giotto with his pedestrian processional crosses to a work of genius in just a hundred years? Shakey So Giotto is rubbish now? Big Brain Christian art, sycophantic claptrap. Shakey Highlight for me were the reliefs by Pisano from the campanile. Big Brain You’re just a modernist looking for modernism at every corner. Shakey So Masaccio’s “Trinity” is top dog then? Big Brain Absolutely, pure metaphysics! Draws you right in, Humanism starts there. Shakey Bargello wasn’t bad for a disused torture chamber. Big Brain More Winkelmann fuzziness, except for the Cellinis. No fake eroticism there. Shakey And Donatello’s Mary Magdalene, I loved it. Big Brain Just a slightly creepy Giacometti. Shakey True. None of your endless madonnas and bambinos there. Big Brain Dostoevsky wrote “The Idiot” here in Florence. Crippled by epileptic fits. Big Brain More beer? It’s Christianity that has killed us, you know that of course? If we had let Antiquity takes its course into modern times we would all be the better for it. Bloody church holding us all back in the stone age, bloody perverts, peeping at Ovid in their clammy libraries when nobody was looking. Obscurantist power brokers. Just imagine no christianity, just Socrates and Cicero. Civilization’s been hijacked! Big Brain Drink up. You don’t know any better. Big Brain Don’t they sell drugs there? Shakey About thirty years ago. Big Brain Pity! Boboli Gardens then? Big Brain What was the name of that girl? Last time we were here…..
Shakey Don’t start on that. “I was hungry and it was your world”. Big Brain Please don’t sing! Browning? Big Brain So, the Uffizi then? Shakey Over my dead body. Big Brain I have to call my wife. Shakey Can we sit down my back is killing me? Big Brain A workman-like city this, all business, what you see is what you get. No untidy corners or spooky baroque thrills. Shakey Have we had enough? Big Brain I think so don’t you?